As Jarvis gets older, I look for ways to inject references to being different into our conversations. He doesn’t know he’s different yet, or if he does he hasn’t mentioned it to me. However, I’m adamant that I don’t want the first mention of his smile being different coming from a kid in the playground who is either innocently inquiring about it or, even worse, teasing him about it. I tell him that he has facial palsy, and that this gives him a unique smile and that being different is a good thing. As he also has a motor speech disorder, he hasn’t given me any indication that he understands this but I think if I repeat it often enough, along with a message of total acceptance and love, that he will come to accept and own it and hopefully be proud of who he is. 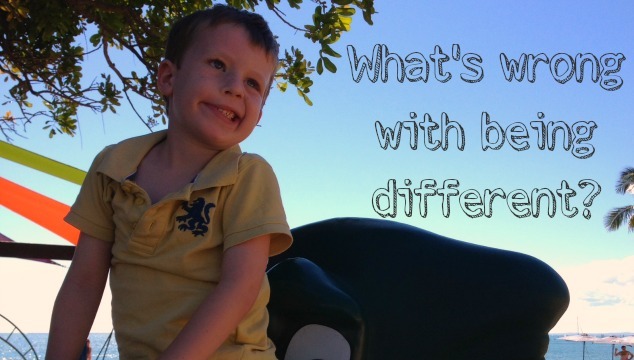 However, in navigating this space of difference for the last four-and-a-half years, and trying to form our family plan of attack, I started to think that talking about difference is important for every child and parent, even those not living with a difference. I can attempt to arm my son with ways to respond, to help him build his self worth and inner confidence, but my fear is that he’ll get into the big wide world of school and find a place where being visibly different is something that isn’t received as well as I’ve been telling him. So, how can we make being different more acceptable? I truly believe it starts with us! To arm our children with the strength to be themselves, however that is for them, is to gather the strength to be our own true selves. This is the biggest lesson I’ve learnt through parenting Jarvis – my words have to match my actions and by accepting myself unconditionally with all my flaws, I’m showing him how to do it too. In all areas of parenting, our words mean nothing if we’re not living by them, so I try and accept myself for who I am and I aim to live my life to the best of my ability. We can’t control the world we live in and what people will say about us, but we can control what we say about ourselves and I choose to change my negative self-talk into positive (or at least neutral!). The best advice I’ve heard on this is to start treating yourself as tenderly as you would your child or a good friend, and watch how your self-talk changes. I try and be as open as I can about things both here on my blog and in real life. Again, hopefully I’m modelling a way for my boys to be open with me if they’re having difficulties in life. I want them to know that life isn’t always perfect, but within imperfection are incredible lessons to move you forward towards a happier time. I’ve become hyper aware of how people talk about anything that’s different (particularly appearance-wise) since Jarvis was born, and it’s truly shocked me how often people comment about differences in other people – be that in the way they dress, act, or their beliefs. I know most of the time this is only to make conversation, but often times it sounds really ugly. ‘That old adage of if you can’t say something positive, don’t say anything at all’ still applies! We are all different, which is something that should be celebrated rather than condemned. I come from a long line of feeling bottlers, so talking about feelings is not something that comes naturally to me and something I really have to work on. So, instead of bottling all my feelings up like I once did I try and name them and then deal with them accordingly. I tell my kids if I’m feeling a bit sad or frustrated and angry and why I’m feeling that way and encourage them to do the same. Feelings don’t have to be big scary things we feel we have no control over (which is how I once felt). My friend Kate bought the boys Tracey Moroney‘s ‘When I’m Feeling’ box set of books and they’re just terrific. Talking about that it’s OK to feel a certain way is a great way to build resilience and hopefully give them a way to communicate difficult feelings, rather than bottling them up, as they grow. While it’s true we can’t control the world we live in, we can do our little bit to change it. There’s always a lot of hand-wringing about bullying in the press, but then we have magazines that pinpoint people’s flaws for entertainment and endless dissecting of people’s choices and actions. So, I do my little bit by saying no to negative, sexist and trashy media. I say no to products that I feel are being advertised in a way that’s sexist, demeaning or just plain homogenised. I say no to unnecessary gender-stereotyping of children. I say yes to letting my sons be themselves. I say yes to supporting each other rather than cutting each other down. I say yes to more diversity in our world. I say yes to more music, more crazy dancing and more joy. I want to model that for my children. I want to tell them that there’s no one way to be successful. I want my beautiful eldest child to accept himself, crooked smile and all and have the world do the same. Oh, if the world could do the same. Please share if you agree with me and add your thoughts below in the comments!